There have been a few updates (two three that is) to BossPrefs in the last few days. 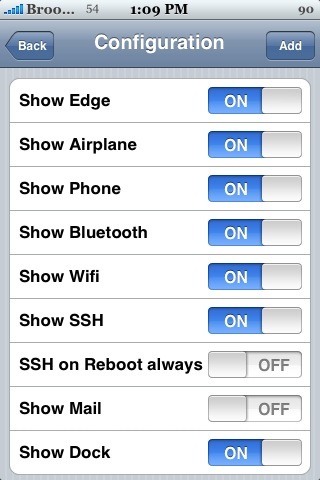 The updates have added the ability to toggle (turn on/off) Airplane mode and Phone. If you toggle the Phone off…it will disable your phone but will keep your Wifi active. Unless of course you toggle that off too and in that case you would probably just turn your entire phone off! :) Anyway, I can’t seem to get the Phone toggle to work. I toggle it off and it doesn’t seem to disable my Phone and when I go back into BossPrefs it is back to being toggled on, even though I hadn’t turned it back on. Let me know in the comments how it is working for you. Other than that…I still love BossPrefs! BossPrefs is available through the BigBoss source. Update: There has been an update to version 1.65 of BossPrefs and according to the developer version 1.65 “Fixes airplane mode to work on 1.1.2 and lower, airplane mode to work if you’ve never used the airplane mode GUI option in settings, and adds a new airplane mode icon. Note: phone toggle won’t work on contract carriers like AT&T.” Well, that answers that. No wonder I couldn’t get it to work! Thanks BigBoss!! You know we love you! There is allready a 1.65 version from today. I just updated to 1.65? You are right..that must have just come out because I just checked the Installer and BigBoss’s website and it wasn’t on either…I will update my post. i dont get the icons dock in bossprefs, and he sayd it scrolls, what does that mean? The dock will only display four icons at a time. However, you can add more then four icons. If you add more than four icons, just swipe your finger on the dock and it will scroll through the rest of the icons you have added. Having apps on the dock is just a quick way to launch an app. If you have BossPrefs on your the first page of your SpringBoard you can just open it and tap an app on the dock to launch it instead of trying to find it on your SpringBoard. It is just a way to have everything in one place. FYI: if you add an icon to the dock of BossPrefs…it removes it off your SpringBoard. Wipe your finger from right to left, and the icons scroll, i.e. showing you the rest. I for instance, put all my phone/system related apps there. How are you , I hope you are doing well . I have a question ,is it exsist any program for iphone that , when you call someone by iphone to record the conversation ???????????????? if you know it , please let me know.